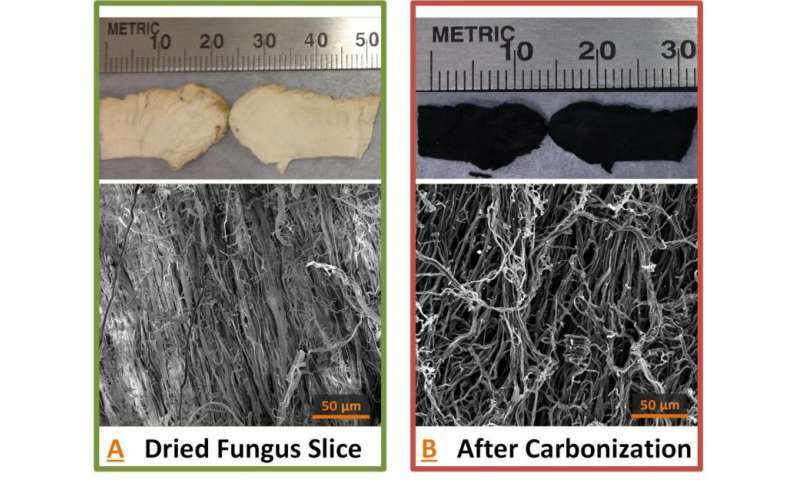 Carbon fibers derived from a sustainable source, a type of wild mushroom, and modified with nanoparticles have been shown to outperform conventional graphite electrodes for lithium-ion batteries. Researchers at Purdue University have created electrodes from a species of wild fungus called Tyromyces fissilis. "Current state-of-the-art lithium-ion batteries must be improved in both energy density and power output in order to meet the future energy storage demand in electric vehicles and grid energy-storage technologies," said Vilas Pol, an associate professor in the School of Chemical Engineering and the School of Materials Engineering. "So there is a dire need to develop new anode materials with superior performance." Batteries have two electrodes, called an anode and a cathode. The anodes in most of today's lithium-ion batteries are made of graphite. Lithium ions are contained in a liquid called an electrolyte, and these ions are stored in the anode during recharging. Pol and doctoral student Jialiang Tang have found that carbon fibers derived from Tyromyces fissilis and modified by attaching cobalt oxide nanoparticles outperform conventional graphite in the anodes. The hybrid design has a synergistic result, Pol said. "Both the carbon fibers and cobalt oxide particles are electrochemically active, so your capacity number goes higher because they both participate," he said. The hybrid anodes have a stable capacity of 530 milliamp hours per gram, which is one and a half times greater than graphite's capacity. Findings are detailed in a paper appearing online March 17 in the American Chemical Society's Sustainable Chemistry & Engineering journal. One approach for improving battery performance is to modify carbon fibers by attaching certain metals, alloys or metal oxides that allow for increased storage of lithium during recharging. Tang got the idea of tapping fungi for raw materials while researching alternative sources for carbon fibers. "The methods now used to produce carbon fibers for batteries are often chemical heavy and expensive," Tang said. He noticed a mushroom growing on a rotting wood stump in his backyard and decided to study its potential as a source for carbon fibers. "I was curious about the structure so I cut it open and found that it has very interesting properties," he said. "It's very rubbery and yet very tough at the same time. Most interestingly, when I cut it open it has a very fibrous network structure." Comparisons with other fungi showed the Tyromyces fissilis was especially abundant in fibers. The fibers are processed under high temperatures in a chamber containing argon gas using a procedure called pyrolysis, yielding pure carbon in the original shape of the fungus fibers. The fibers have a disordered arrangement and intertwine like spaghetti noodles. "They form a conductive interconnected network," Pol said. The interconnected network brings faster electron transport, which could result in faster battery charging. Electron microscopy studies were performed at the Birck Nanotechnology Center in Purdue's Discovery Park. i suppose it's possible that companies would adopt growing mushrooms to incorporate into electronics, but honestly, I do not see it happening. If they can replicate the mushroom structures artificially, it might make sense.